Spurs lost 4-3 in a classic encounter against City in Wednesday's quarter-final second leg, but went through on away goals after the tie finished 4-4 on aggregate. "We are all tired after an amazing, crazy and unbelievable night," Pochettino told a news conference on Thursday. "We need to assess some players, we need to assess some players that cannot be possible to play. It can give massive belief but if you are not clever enough to manage it, that victory can make you weaker," said Pochettino. We are not optimistic but you know Harry Kane - with Harry Kane, all is possible," he added. PETALING JAYA: There will be water disruption in the Klang Valley for up to 86 hours beginning April 24. This is due to the shutdown of the Selangor River Phase 2 Water Treatment Plant (LRA SSP2) for upgrading works. The districts affected are Klang, Shah Alam, Petaling, Gombak, Kuala Lumpur, Kuala Langat, and Kuala Selangor. He added that Air Selangor will take measures to minimise the impact of the water supply disruption. "Air Selangor expects about 50% of the affected areas will start receiving piped water supply again in 24 hours," he said. SHAH ALAM: A one-page spread from the minutes of the Selangor State Executive Council meeting in October last year that went viral on WhatsApp today has raised the question whether the Kuala Lumpur International Airport (KLIA) will be renamed Sepang International Airport (SIA). In the minutes of the meeting, among others, mentioned the proposed name and it was stated that the suggestion would be brought to the National Transport Council meeting. 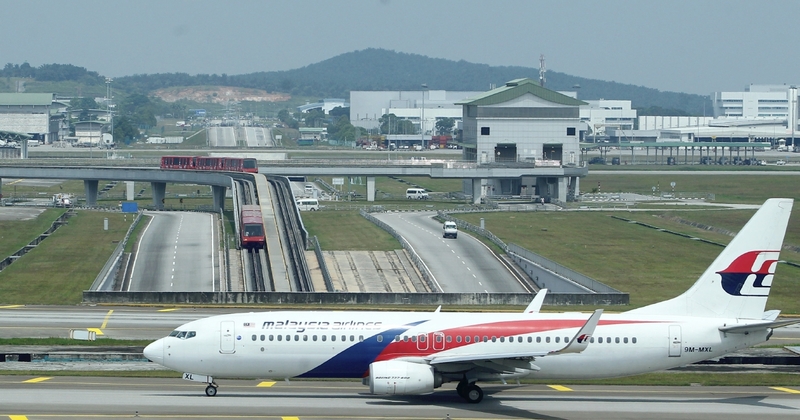 “This matter arises because KLIA is located in Sepang, Selangor. The meeting minutes also mentioned the need for KLIA to be in line with other international airports that use the location as the name of their airports. The document also stated that Ng had agreed to bring the matter to the National Transport Council meeting. KUALA LUMPUR (Bernama): Tun Daim Zainuddin has expressed confidence that the price tag for the East Coast Rail Link (ECRL), which was reduced by RM21.5bil to RM44bil, is highly likely to come down even further. He said this was possible once rail construction experts in both Malaysia Rail Link Sdn Bhd (MRL) and China Communications Construction Company Ltd (CCCC) sit down to work out the technical details of the mammoth infrastructure project. Earlier this week, MRL and CCCC agreed to form a 50:50 joint-venture (JV) company to manage, operate and maintain the ECRL rail network. Daim also clarified that the supplementary agreement for the ECRL includes double-tracking for the entire 640km rail line. "Those who are saying that the new cost of RM44bil came at the expense of certain features such as double-tracking are lying. The six-month (maximum) BWF protected ranking designated to the shuttler, who was diagnosed with nose cancer last July, is only valid for a year, and Chong Wei was granted eligibility for it on Aug 15 last year. Chong Wei was even forced to put his much-awaited comeback on hold twice (All England and Malaysia Open) after being advised by his doctor in Taiwan. In other words, the later Chong Wei makes a return, the harder it would get for him to collect enough points for Olympic qualification. So apart from having to worry about world ranking points, Chong Wei will also have to overtake several other Malaysian shuttlers, who are currently ranked above him. The top two Malaysian shuttlers currently are Lee Zii Jia (No 22) and Liew Daren (No 25), while the rest who are ahead of Chong Wei include Chong Wei Feng (No 64), Soo Teck Zhi (No 68) and Soong Joo Ven (No 73). KUNAK (Bernama): The travel advisory issued by the United States, with Malaysia in the "K" list of countries with risks of kidnapping and hostage-taking, should be withdrawn, says Tan Sri Mohamad Fuzi Harun.The Inspector-General of Police said it was very disappointing as the travel advisory issued by the United States was without basis.“In terms of security control, Malaysia is always serious and prepared to face any possibilities.“At the moment, we are focusing on the east coast of Sabah and the Royal Malaysia Police are working closely with other security agencies,” he told reporters after a working visit to the Kunak police headquarters here on Thursday (April 18).He was accompanied by Sabah police commissioner Datuk Omar Mammah.Mohamad Fuzi said the travel advisory issued by the United States did not match the number of tourist arrivals to Malaysia, including to the Eastern Sabah Security Zone (Esszone), which had increased from time to time.“The travel advisory somehow affects public confidence, including of foreign tourists, to come to Malaysia, especially the coastal areas,” he added.He added that Malaysian police were actively monitoring the encroachment of Foreign Terrorist Fighters (FTF) into the country following the Islamic State militants' plan to make Sabah a transit point before going to the southern Philippines.He, however, said the situation is under control as continuous operation is being conducted against militants.“Thirteen FTF arrests were made last month, including in Sabah.“We know they want to make Sabah their transit to the southern Philippines, but we will not allow that to happen,” Mohamad Fuzi added. "These findings are consistent with several independent and scientific reviews, including by the International Atomic Energy Agency. "More specifically, Regulation 9(6) of the Storage of Scheduled Wastes, Environmental Quality (Scheduled Wastes) Regulations 2005 states that 'a waste generator may apply to the director-general (of the Department of Environment) in writing to store more than 20 metric tonnes of scheduled wastes'. "Mashal explained that the neutralisation underflow (NUF) residue was a magnesium-rich gypsum, which was non-radioactive and non-toxic. "As a 'scheduled waste' under Malaysian regulations, it is regulated by the Department of Environment (DOE). The DoE has periodically consented to the storage of NUF on-site while allowing Lynas to pursue R&D on the reuse of NUF. Companies without a digital strategy are akin to planes flying with just one engine — if they do not do something fast, they will crash and burn. One example is OYO Rooms, a platform that allows users to book budget hotel rooms that adhere to a certain standard of quality. OYO Rooms founder Ritesh Agarwal launched a start-up that copied the Airbnb model seven years ago, which lets users list and rent out rooms online. You mostly travel by train and stop at various stations looking for a budget hotel to stay the night. He approached the budget hotel operators to let them offer him some rooms to help fill. JOHOR BARU: Eight places of worship affected by the Gemas-Johor Baru electric double-tracking rail project here will be relocated, says the Transport Ministry.Its Minister Anthony Loke said the ministry had received support from the state government in identifying suitable locations for the relocation of these places of worship. "We will ensure that negotiations and relocation will be handled with the utmost respect. "We have relocated or demolished 191 of these buildings, while another 133 will be dealt with soon. "We will ensure that it is done in a respectful manner in order to avoid any issues. "Funds will also be provided for them to relocate,” he said.He added that the project is ahead of schedule, with over 37% completed so far.The RM8.9bil Gemas-Johor Baru double-tracking project, spanning 192km, is expected to be completed by October 2021. PETALING JAYA: Wisma Putra has confirmed that one Malaysian traveller was injured due to a rockfall at Taiwan’s Taroko National Park after a 6.1 magnitude earthquake struck the coastal city of Hualien on Thursday (April 18).The Foreign Ministry also said the victim, who was injured after he was hit by falling rocks when visiting the park, has been admitted to the Hualien Tzu Chi Hospital. "Wisma Putra via the Malaysian Friendship and Trade Centre will continue to monitor the victim in Taipei and will give assistance accordingly," it said in a statement.The Ministry said Malaysian citizens involved in the incident and needing consular assistance are advised to contact the Malaysian Friendship and Trade Centre at 8th Floor, San Ho Plastic Building, 102, Dun Hua North Road, Taipei, Taiwan R.O.C.They can also contact +(886) 22713 2626 or the representative officer at +(886) 90574 6271 or email them at mwtaipei@kln.gov.my.Earlier, quoting several Taiwanese media, China Press reported that two Malaysians were injured during a rockfall at the Taroko National Park.A female tourist injured her head, hit by falling rocks, and the lower body of a male tourist was trapped under the rubble at the Lushui Trail of the national park.According to the reports, due to the earthquake, the Lushui Trail in the national park has collapsed.It was reported that the quake struck at about 1pm local time in eastern Hualien, at a depth of about 19km. JOHOR BARU: Six family members, who have been living in poverty, were shocked when enforcement officers from the Johor Housing Secretariat (SUK Perumahan) evicted them from their flat on Tuesday (April 16). The family had failed to pay rental arrears at Flat Tasek 64, Seri Alam, here, which amounted to RM6,900, but has been granted a temporary reprieve. Mohd Zin Mustafa, 47, said he had stopped working in Singapore after being a victim of a hit and run in 2015. Johor Women Development and Tourism Committee chairman Liow Cai Tung said the state government would find ways to help the family. Liow said the rent is RM100 per month, and the tenants should have earlier talked to SUK Perumahan or approached the state government. KUALA LUMPUR: Malaysia intends to bring back the Formula One (F1) race, as there is still much interest in the sport, says Prime Minister Tun Dr Mahathir Mohamad.Dr Mahathir, however, did not mention exactly when the race could make a comeback in the country.“We intend to bring back the Grand Prix, but I don’t know if it’s next year or the year after.“But the interest in Grand Prix is still very big and we want to bring back the race here, because it has stimulated many Malaysians to go into the automotive industry,” said Dr Mahathir when speaking at the American Malaysian Chamber of Commerce luncheon here Thursday (April 18).He added that many Malaysians have become “addicted” to motor vehicles and buy all kinds of new motor vehicles.Dr Mahathir said that despite not hosting the international race, Sepang is still bustling, as many go to the racetrack there.“Lots of people come, race there, (they) have motorcycle races there.“And a lot of people buy expensive cars, especially in Singapore.“In Singapore, they don’t have the chance to drive there. When they come to Malaysia, they find that breaking the speed limit here is okay,” he quipped.Dr Mahathir also felt that by having the Grand Prix again, there will be many spectators.“We will be able to get spectators, more than 100,000 people and that will be worthwhile for us.“Besides, when we have the Grand Prix, the television stations will broadcast this all over the world, bringing about 200 million viewers,” he said, adding that it was good advertisement for Malaysia.In 2017, former prime minister Datuk Seri Najib Razak announced that Malaysia would stop hosting the F1, after the government decided to terminate the hosting contract.Najib then said the decision was made due to a significant decline of returns since Malaysia first started hosting the event in 1999. BARCELONA (Reuters) - Barcelona have announced they will visit Japan as part of their preparations for next season, facing Premier League Chelsea in July as well as former captain Andres Iniesta's side Vissel Kobe, who play in the Japanese top flight. The La Liga leaders will meet Chelsea on July 23 at Saitama Stadium in Tokyo before travelling to Kobe on July 27 for the game against Vissel, where they will play against Iniesta and fellow former Barca players David Villa and Sergi Samper. Both friendlies are being organised by Barca's main sponsor Rakuten, the Japanese retailer. Barca have spent their last two pre-seasons in the United States competing in the International Champions Cup and have not visited Asia for pre-season since 2013, when they played in Thailand and Malaysia. They have not played in Japan since winning the 2015 Club World Cup, beating River Plate 3-0 in Yokohama.